A short history of the partially successful wildcat strike of women workers in London's public transport network during World War I for a war bonus payment and equal pay with men. As World War I progressed, thousands of jobs normally done by men were taken over by women, and nowhere was this process more marked than in public transport. Both management and the unions had consistently opposed conceding the principle of equal pay for what was obviously equal work. 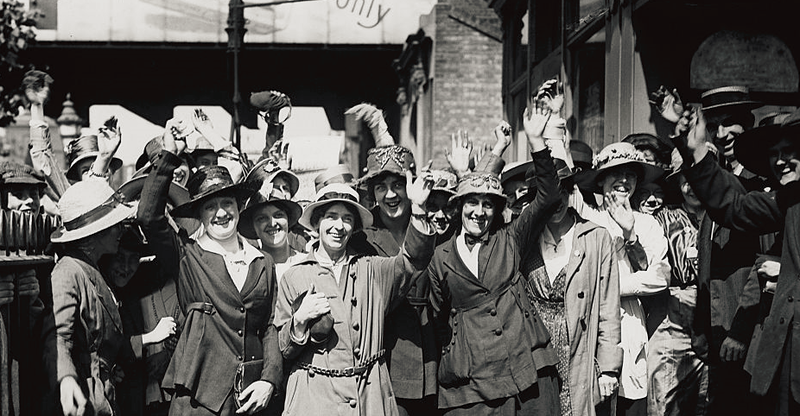 On August 16th, 1918, there was a meeting of women at Willesden bus garage which decided, without consulting or even informing either the management or the trade union leaders, to strike the following day. The next morning Willesden stopped work; they were immediately joined by women at Hackney, Holloway, Archway and Acton depots or garages, and thereafter the strike spread like wildfire. By the evening thousands of women had stopped work. The striking was initially for a 5s War bonus, a demand which was superseded as the struggle continued by the straight issue of equal pay, or as the strikers put it 'Same work - same money'. The strike continued to spread. By August 23rd, women bus and tram workers at Hastings, Bath, Bristol, South Wales, Southend and Birmingham had joined in, about 18,000 women out of the 27,000 employed in the industry had stopped work, and in addition women working on the tubes - supported by some men - had stopped work on the same issue. The strikers had a series of mass meetings at the Ring, Blackfriars, where 4,000 women, many of them with children, well supplied with sandwiches and lemonade, made a day out of it. The strike was settled on August 25th after a tumultuous meeting at the Ring, and against very strong opposition, while the tube women remained out until the 28th. The women received the extra 5s War bonus, but the principle of equal pay was not conceded. The details of organisation of this important struggle are obscure; indeed it is rather surprising that this strike, which must be one of the largest ever engaged in by women for their own demands, has not attracted more attention from historians of the labour movement. Taken and slightly edited from Don't be a soldier! by Ken Weller. 1. The struggle of women transport workers was not isolated. In the same month there was agitation among school teachers, and the unrest spread to workers at Woolwich in November - when 6,000 'munitionettes' took the day off and demonstrated in Whitehall. There were numerous other smaller strikes and demonstrations. For example, in October 1918 women street cleaners in Holborn struck; that they had strong local support was shown when there were violent clashes when housewives set about blacklegs with brooms. There was also a series of upheavals among the thousands of women 'temporary' workers at the Mount Pleasant postal sorting office at Clerkenwell; the unions representing 'inside' staff had refused the women membership, so they had to set up their own unofficial committees.